The Oil Drum: Local | New York to Move Away from Oil? New York to Move Away from Oil? Let's envision the New York State the next generation will inherit from us - let's consider the limitless potential the future holds for the great State of New York. We don't have to look far for evidence that the time to transition away from foreign oil is now - it is right there on the gas pumps and in our home heating bills. Not just here in New York, but across the nation, our reliance on foreign oil is hampering the financial freedom of our working families and their employers; it is hurting our economy, damaging our environment and enriching regimes that support, harbor and encourage the terrorists who threaten our national security. I'm glad that Pataki is raising these issues as not just environmental do-gooding, but integrating financial and security issues. As a state with little fossil fuel reserves, stimulating development of renewables is critical for New York's survival in a peak oil world. Let's continue to build on that record of accomplishment by making New York State the leader in reducing dependence on imported energy. The entire world is now grappling with the question "where will we get the energy to power the global economy of the 21st century without causing irreparable damage to our natural environment?" Let's make New York the place where that defining question is answered. Let's make New York the worldwide center for clean, renewable energy research, product development and job creation. So, how would he achieve this? Let's attract companies from around the world that are developing the clean, renewable energy sources of the future - let's make the entire state a tax free zone for this growing industry. Because of the investments we have made in mass transit, we already have the most efficient transportation system in America, but we can do more - much more. Our transportation system is still over 90 percent dependent on petroleum products. The huge price increases we have seen at the pump are likely to get worse as developing countries like China and India consume an increasing amount of oil. Later this session, I will propose a plan to jumpstart a new era of statewide availability and use of renewable fuels - ensuring that more of our energy dollars stay right here in New York. It begins with an initiative to make renewable fuels available at service stations all across the state, starting with the New York State Thruway. And then, it goes a step further, by making that renewable fuel tax-free throughout the entire State of New York. I hope instead of just offering ethanol, which we know has dubious EROEI benefits given how much agriculture is dependent on fossil fuels, there are other ideas about pluging in hybrids and other ideas. I also hope Spitzer and other candidates to succeed Pataki take up these issues. In fact, why not log-on to Spitzer's new Blog and tell him that you liked Pataki's proposals on renewable energy. A good start would be to encourage the building of wind farms off Cape Cod. Actually, Cape Cod wind power wouldn't go to New York, it would go to Massachusetts. There are proposals to build wind farms off Jones Beach though. I doubt either would happen since those pieces of real estate are among the most valuable in the world. Maybe New York could push wind power on the continental shelf. There have been some very interesting announcements of schemes for floating turbines in the past few months, and it would be good to accelerate some test installations and get data. I'd like to see a ring of windmills encircling the D.C. beltway. All aimed toward the capitol. He hit the nail on the head there. A great start to a presidential campaign. It would be hard for either side to obfuscate their way out of that as topic #1 for the campaign. Is there a concrete proposal behind this, or is it just talk. I too wonder whether he means ethanol. Anybody else think that Girl trying to sell us Emissions Stickers for our SUVs is cute? Sorry, I just had to say something. Yep. Cute as a bug. Staten Island is putting 6 wind turbines on the site of the old landfill, according to the Borough President. This is enough to supply electric power to 5,000 homes, at a cost of approx. $80,000 each. For the whole story, follow this link...and let me know what's good and bad about this. I currently live between the Catskills and Hudson Valley in NY. My parents still live in western NY, south of Rochester. Over the holidays I was talking with my Mom about wind energy and she told me in the flatlands between Rochester and Buffalo there appears to be a substantial backlash building against siting wind farms. One of the bigger projects already on-line in NY is in this area, near Batavia. My Mom recently traveled thru the area and said there are signs in a lot of front yards voicing the resident's disapproval of other proposed farms. The whole conversation just left me shaking my head. The region is mostly farmland - the farmers are hurting and I would think this gives at least some of them hope to continue farming and get some add'l profit on the side. For the most part the land is wide open spaces and, while I can understand not wanting the whole lot of turbines in your backyard, if they're sited responsibly I can't imagine they'd be that big of a nuisance (I personally think a cluster of the things all going at the same time looks cool as hell - but that's just my opinion). I might also add that the whole area is about as economically depressed as you can get and I would think the locals (and the state as a whole) would welcome any job opportunities associated with further development of these projects. And the only other thing I'll add is that growing up out that way I just remember the wind blowing like hell ALL THE TIME so I think they've picked a great area for it. Sorry about such a long post. How could Batavia say no to it? There are many beautiful places on earth that I would not want to see fields of windmills, but Batavia is the most depressing place on earth. Some states--Minnesota I think--have programs where farmers are paid handsomely for allowing windmills on their land. If New York had something like that I guarantee the Batavians would change their tune. One of the issues is the FAA regulations for tall structures. The warning strobes can be very irritating; I'm amazed that more of them are not regular targets of sharpshooters. Well, one reason for not wanting a large wind turbine in your backyard, apart from it being highly intrusive (and some would say ugly), is that it tends to produce a very unpleasant low-frequency vibration. A lot of work has been done on reducing this vibration, but it is has not been completely eliminated. Of course, if you're far enough away, that wouldn't matter. I'm all for wind power where it makes sense, but I would not want to live close to a large wind turbine, just as I would not want to live close to any power plant. I totally agree with you joule about not wanting those things as a lawn ornaments. I have to admit that I don't know how these farms are typically arranged as far as placement of the turbines etc. I am pretty familiar with that area though and there are a lot of farm fields and I guess I envisioned a set-up with a couple large central plots with the turbines and then these plots are surrounded by a buffer of productive cropland. In some instances it might be tough to satisfy set-backs from every single house on a rural road but, if a farmer were compensated fairly, with all the land available out there I think the physical aspects of siting could be overcome. Now, overcoming the pre-conceived notions of something new in an area whose last great technological leap forward was either the Erie Canal or the old coal fired locomotive (take your pick) - I think that's where the real issue is... (Don't be offended western NY - you'll always be home - if only you had some damn mountains). If the issue for most people is truly the visual disturbance caused by the windmills in the distance then I have no good way to argue against that. They are the landowners and I'm sure they didn't buy thinking they'd be seeing a bunch of those on the horizon. I could attempt the rather weak comeback of "well, it might beat seeing the cooling towers of a nuclear plant on the horizon - at least the windmills are dynamic, while nuke plants just sit there, kind of spooky since you know there's some serious stuff happening inside that containment..."
They look cool when they're new. They're eyesores after a few years in the elements. 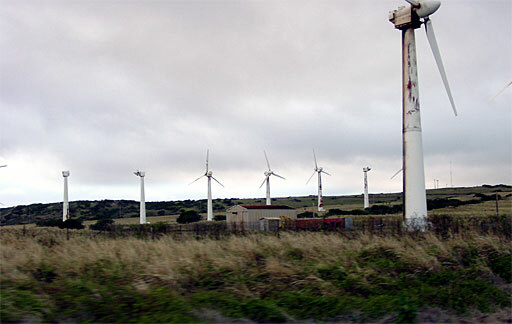 Most of the turbines were not spinning. Some did not even have any blades left. There's talk of replacing the aging turbines with newer models, but I don't know if or when it will happen. Hawai`i gets most of its energy from oil, but even at current prices, it's still apparently not worth anyone's while to maintain the wind farm. This is why I wonder how sustainable wind really is. Maintenance and infrastructure are expensive, and they don't get any cheaper when oil prices are high. Disappointing window dressing and doomed to failure - after the election. The politicians will also "sell off" a few tax favors for campaign contributions. In Pataki's case, he's trying to buy Midwest farmer votes and ADM contributions for his presidental run. Almost as disappointing as Schwartzenegger's solar roof programs - at least I don't pay NY taxes. Danish investments in wind power has obfuscated the general public in Denmark, Sweden and probably other countries about their reliance on and investments in coal power. Almost the only people taking about Danish coal power in Sweden is knowledged pro nuclear people pissed off by the mothballing of the Barsebäck nuclear powerplant. ( 2 x 600 MW BWRs of an early design. ) We get their smoke and they get to see the Barsebäck buildings from their shore, how terrible for their environment. I think the main mistake was not having a 51% ownership by Danish utilities in Barsebäck or building them within eyesight from Denmark wich made sense due to our integrated grids. I have heard rumours that the original idea were to interchange building of pairs of nuclear reactors in Sweden and Denmark. The Danes bough a reserch reactor, started to educate staff and create the authorities needed to licence nuclear powerplants and then oil and gas was found in the North sea, an anti nuclear opinion spread and the increase in electricity demand slowed down. My reading of what Pataki said wasn't so much that we should be looking to other sources of energy because there won't oil one day, but because we're giving our money to foreign countries, it hurts the environment, and some of the people that get our oil money support terrorism. THese are all good reasons to lessen our dependence on foreign oil, but except for the environmental concerns they could point to drilling in ANWR, the oil sands of Alberta, or even more drilling offshore. George Pataki is not a visionary, never has been never will be. If he somehow managed to become President it would be the ultimate symbol of how little Americans expect of our leaders. As to the pictures of wind farms I could show a few hundred pictures of my native state New Jersey that are even uglier, more dangerous to everyones health, and just generally depressing. Just watch the opening to a Sopranos episode. The Hydro-P uf plant they show is still there, only with TREES growing out of the roof and another one of the letters fallen down. We take a perverse pride in it, but in any other state such a building would have been torn down years ago. BTW that building has been empty for at least 20 years. i heard on the radio that a survey was taken, and it was found that those more "likeable" were more likely to succeed in business than those who were more "intelligent". Not coddled by the oil industry? Not subject to a do nothing environmental lobby? Someone who is giving America a vision on what we must do to survive from foreign entanglements and geopolitical world wars?!? Has the ghost of former NY Gov. Teddy Roosevelt entered Pataki's dead political body?? ?